It’s a sickness. I have Amazon Related Shoppers Sickness. I will bankrupt us $9.98 (or less and with free Prime shipping) at a time! A quick glance at recent my purchases shows a penchant for plugs, wires, cables, adapters and gadgets. When you get to the point where you’re looking to buy adapters so esoteric no one has thought to make them you know you’ve gone off the deep end. When we moved to this house Stef made me justify every cable I owned. She was ruthless! No pressing need, out it went. I’m now back above pre-Stef levels! That didn’t take long. I found my latest ‘must have’ gadget yesterday while getting my hair cut. Jennifer took out a large circular spring loaded piece of plastic which fit over the selfie camera on her iPhone. 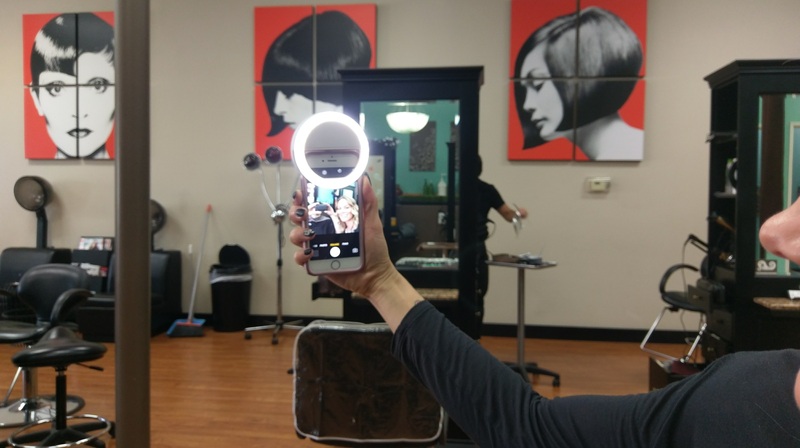 It was a miniature ring light! Ring lights are used a lot in portrait photography. They offer smooth light and few shadows. They worked well on the shots she and I took at her shop. It arrives here Sunday. I couldn’t resist. Where has my willpower gone? Like You, I have a problem with ARSS. When I flew to CT last week I sat next to a guy with a little device called a “KURV Stand” I went right home and bought it. The only problem with that light is that it looks like it only works well for the selfie side, not the back. I don’t take a lot of selfies. Good Luck on Tuesday, I’ll have you in my Thoughts and Prayers.